Spoilers ahead for the most recent episode of Game of Thrones. Now that we’re three episodes in, we’re starting to get a clearer picture about where Game of Thrones is headed this season — Arya’s started assassin school, Sansa’s betrothed to torture king Ramsay Bolton, and Cersei’s found religion. To help keep these and other stories straight, we turned to showrunners David Benioff and Dan Weiss, as well as writer/producer Bryan Cogman, to ask about some of the choices they’ve made in adapting George R.R. Martin’s A Song of Ice and Fire series, and going off-book. Benioff and Weiss answered our questions via email, while Cogman talked to us in Belfast during an international press day, when Vulture visited the set for the House of Black and White. We’ve condensed the two discussions below. Identity — whether it’s denied or swapped for another — is a big theme at this point in the story. We’re not necessarily getting all of those subplots from the books, where various folks masquerade as others, such as fake Arya. So how did you choose which ones to keep, which ones to switch, and which ones to discard? Particularly since the overriding theme of this episode is how Arya needs to become “no one”? 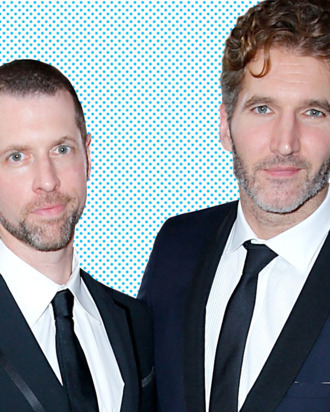 David Benioff and Dan Weiss: Honestly, it’s a very difficult question. In the planning/outlining phase, we immersed ourselves in those sections of the books for the third or fourth time, and thoroughly steeped ourselves in George’s vision. And then we stepped away from the books, and traced a way through Arya’s Braavosi story line that we felt was best for the show, and for the character that Maisie has created. Bryan Cogman: Thankfully, we have it all outlined, because it’s a juggling act. And then George reads the outline every year, and gives his notes and thoughts. When we’re breaking the show, we tackle each character one at a time, and then the next step is the blending and placement of them in an episode: Okay, Arya’s here. Today she does this. Mainly playing up certain beats, like a certain line reading might inform something down the line. We pick and choose what’s from the books, and what we need to satisfy an arc within a given season, so if we want Dany emotionally to start here and end there, we will find what’s in the books at various points to achieve that. And that’s why you’ve seen things that have been switched around. George has talked about the butterfly effect before — the ripples that happen if you make a decision to, say, kill off a character he’s kept alive in the books, or swap a major character’s story line. Do you discuss those with him? Cogman: Oh, sure. Those are always the big conversations, because you’re absolutely right: If you move one thread, then it all changes. You end up having the show universe and the book universe as a result. We’ve been doing that to a degree since season one. Tyrion’s battle in season one, I don’t regret that because it ultimately made Blackwater a bigger event. That ended up being one of the nice things that happened, that for Tyrion of the TV show’s journey, Blackwater being his first combat is better than if we’d had him in the Whispering Wood battle. So any change made is discussed, but it’s always about the story we’re trying to tell, and those characters, and how they behave. It ultimately comes down to, What’s this season’s story? And, of course, having in mind what we want to tee up for later. We’ve been teeing up stuff all the time, since season one. We’ve known answers to questions since season one, the fates of certain characters. We know we can finish the story, so we’re certainly writing with that in mind. If there’s one common denominator for all the characters this season, it’s that most of the protagonists find themselves as strangers in a strange land, whether literally they’re in a strange land or they’re thrust into a situation where they have to behave and act in ways they’ve never had [to] before. I think there’s also an exploration of fundamentalism this season in various forms, in just about every major plotline. What fundamentalist thinking can do to a society, to people. And a lot of main characters have been thrust into positions of power, or falls from power, and watching them navigate it is a big part of this season. How would you say Maisie has evolved as an actress? What are some of the things she brings to Arya that you couldn’t have predicted? She has a particularly moving scene this episode when she can’t get rid of Needle, the sword Jon Snow gave her. Benioff and Weiss: She came to us as an actress. She was probably born as an actress. Being that outrageously good right out of the gate, at 12 years old, it’s just not something you can be taught. We saw hundreds of people for Arya. We saw one Maisie Williams. That said, the intense dedication with which she has applied herself to her craft just keeps making her better and better, able to do more and more with less and less. You never know how raw talent at anything is going to develop over the long run. The fact that she has developed into an actress of astounding subtlety, range, humor, and intensity is entirely due to her work ethic. We got hints of it in season one, when she insisted on learning all of her sword fights with her left hand, because Arya was left-handed in the book. And she has carried that approach to every aspect of the job. She is an amazing person. How do you think people are going to respond if Arya actually becomes an assassin? Or, “We’re going to create an allegory about our relations with the Middle East,” as some interpret Dany’s story line to be. Fans might have expected the Kindly Man to greet Arya in this temple. How did you make the choice to sub in Tom Wlaschiha as Jaqen H’ghar here? Cogman: [Laughs.] He is no one. There is no Kindly Man. There is no Jaqen H’ghar. Benioff and Weiss: We were very lucky to have Tom in season two because he was a dead-on perfect Jaqen. And we were lucky enough to have a show last long enough to be faced with this choice — introduce another character in what is already the largest cast in TV by a large margin, or bend things slightly to bring back a loved character in whom they are already invested. And to do so in a surprising manner that tells us something about the very unusual organization to which he belongs. The choice was an easy one. Cogman: They have a shared history together, so it gives it a dramatic weight. I think having that familiarity and that chemistry that we knew they already had, it just seemed like the right call. And he and Maisie just fell right back in their rhythm. They’re wonderful together. What were some of the hardest challenges that went into making this episode? Benioff and Weiss: The House of Black and White is a location we’ve been looking forward to since we started. Many of the scenes haven’t aired yet, so we don’t want to spoil them, but it’s a unique place in the world. It needs to possess a timeless quality, one that encompasses all the different religions under its roof and also transcends them. Production designer Deb Riley and her art department, and Joe Bauer, Steve Kullback, and the VFX team worked hand-in-hand to make it one of our favorite locations in the history of the show. They were eerie, awe-inspiring sets to walk onto.